The meeting date selected is this coming Tuesday Jan 31 from 7:00-8:00pm. Location: ANC 1A office at 3400 11th St NW Suite 200 (above Meridian Pint, across the street from The Coupe). The theme of the meeting will be local block-level community-building. 1. First, this makes the winter a perfect time to reflect and plan, rather than just react. How can we make a difference in how safe people are and feel in our neighborhoods? How can we build community (which is itself safety-inducing!)? 2. Second, public safety is about more than just crime and criminal violence. It is also about tripping hazards, sufficient lighting, helping less-able neighbors shovel their sidewalks, making sure no one freezes on a cold night, etc. 3. Improving Youth Spaces and Activities -- what options do our young people have in our community for fun, safe activities, what are the gaps in those options, and how can we improve them? As such, our February meeting will be focused on #1 -- organizing at the block level. Our March meeting will be focused on #2 -- public information, etc. I will aim to build some coalitions with people dedicated to each of these issues, and everyone is welcome to come to the meetings you are most interested in. DGS Delicatessen and Colony Club are joining forces to bring DuPont Circle top-notch coffee and bagels. Sadie’s will operate out of the DGS sandwich counter from 7am-11am, Monday-Friday, so you can grab a latte and breakfast before DGS opens its doors for lunch. Sadie’s Weekdays, a collaboration between cousins and friends, is a nod to the classic New York bagel shop, with an emphasis on quality ingredients and preparation. Expect to see a bagel with soft scrambled egg, cheddar cheese, and crispy DGS pastrami. The bagels are coming from DC’s own Bullfrog Bagels. Colony Club’s baristas will be behind the counter, brewing Ceremony Coffee (Annapolis, MD) and pulling shots of Tandem Coffee (Portland, ME). The Sadie’s team is looking forward to improving your mornings in a big way starting Monday, January 30th. DGS Delicatessen is at 1317 Connecticut Ave NW. 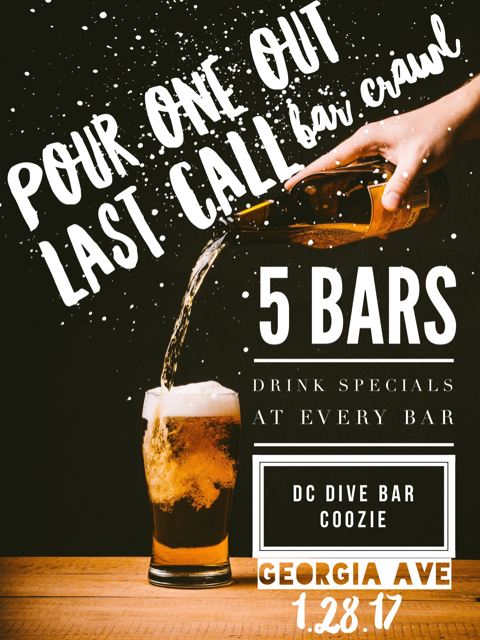 This sounds fun: a group called the DC Dive Bar Crew has organized the Last Call Bar Crawl for Georgia Avenue, going to Looking Glass, Walter's, DC Reynolds, the Midlands and Union Drinkery on Saturday, January 28th from 2-10 pm. 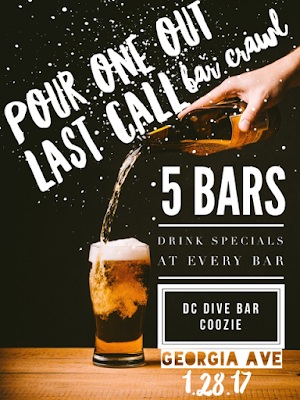 After 3 amazing years, the DC Dive Bar Crew is closing its doors. We are having one final bar crawl, so come Pour One Out with us! We are crawling up Georgia Avenue through Petworth on January 28th. We look forward to celebrating our Last Call with you!$10 early bird (til Janaury 15), $13 regular price, $17 at the door. 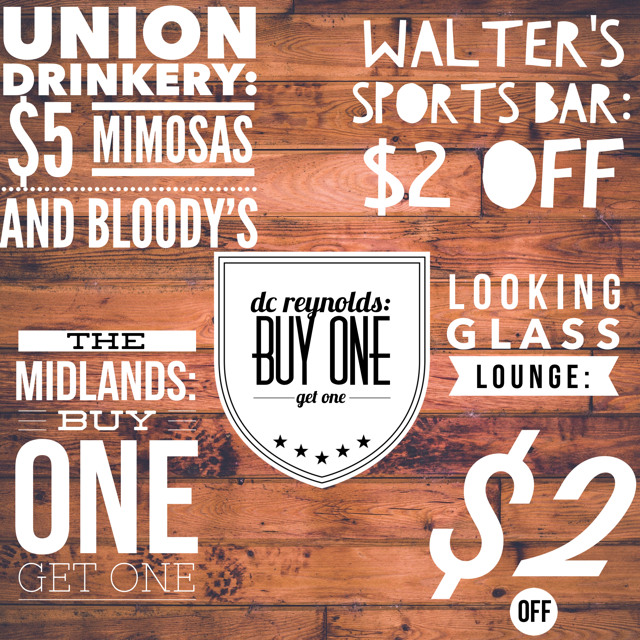 Price includes drink specials at all of the bars and a DC Dive Bar coozie! 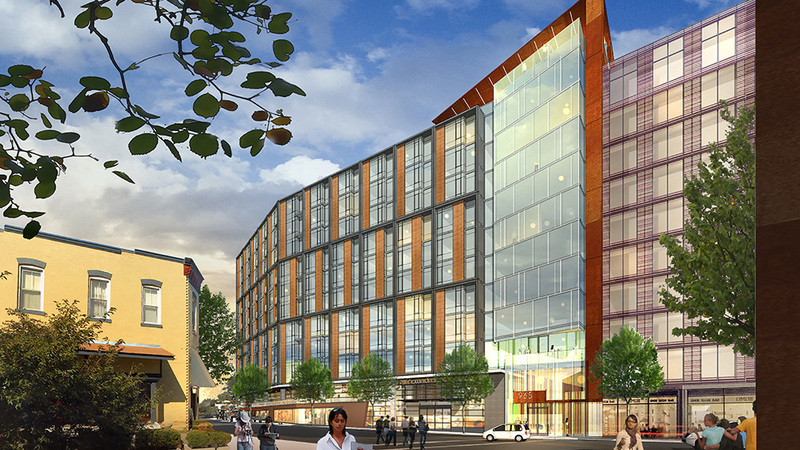 We heard more than a year ago that a Whole Foods was coming to a large development at 965 Florida Avenue NW, just up the street from the 9:30 Club -- and the plans are still on track. Bisnow, a business news blog, writes that the plan is still underway and will also include making 30% of the 428 residential units for tenants with incomes between $30,000 and $50,000. They say it will be called the Griffith, which I am guessing is a reference to Griffith Stadium, the former home of the Washington Senators located just up Georgia Avenue. MRP's website adds that it will be a 375,000 square foot development and they're currently working to get zoning approval. JBG, one of the other developers, also worked on the Atlantic Plumbing building nearby with the movie theatre and Louis building at 14th and U, and Dale Ellis of Ellis Development did the Howard Theater renovation, according to Bisnow. Timing is not clear, nor if there are going to be other retail or office tenants, but it's good to hear it's still in the works. 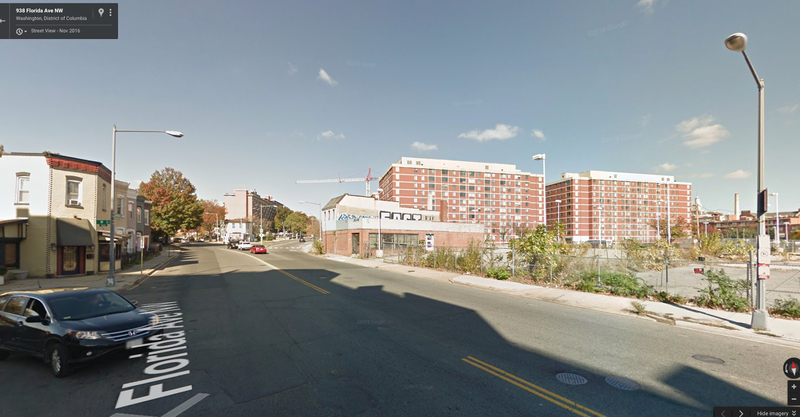 The rendering of the project is above, it's right where W Street meets Florida, just south of Sherman. I wrote a few times during the campaign about Ashley Carter, who ran a pretty innocuous campaign for Board of Education -- she was for smaller classes, closing achievement gaps and the like. If you recall, her website didn't have much detail about her proposals or herself. And for good reason -- the City Paper has a long article about Carter, talking about her campaign and how she hid her true political leanings to win the election against incumbent Mary Lord. And it worked. Carter, it turns out, supports Donald Trump and is very conservative. She worked on far-right Ken Cuccinelli's Virginia governor campaign, who fought against climate science, gay rights (who he called "perverted"), abortion rights, gun control, and more as Virginia's attorney general. He also tried to ban divorce. Her day job, which was described on her campaign site as "a nonprofit for women and families" was with the Independent Women's Forum and Independent Women's Voice, both right wing organizations that the Nation magazine described as "doing the Koch brothers' dirty work." The IWF was founded to support the candidacy of Clarence Thomas for the Supreme Court and the IWV is a PAC founded later. Kellyanne Conway is on the board of the IWF, for example, and the group has advocated against Obamacare, Barack Obama and Hillary Clinton, food stamps, Title IX, and many other things. Carter spoke at a Women for Trump event and during her campaign someone using her account on a message board called her opponent "old and crazy" who "dressed like an old homeless lady" and had a "turkey neck." She's also a Republican, not mentioned by her campaign -- one in which Hillary Clinton received 94% of the city's vote. The IWF is also in favor of school choice (i.e. public money for private schools), supports the positions of Betsy Devos, the Trump nominee for Secretary of Education, and opposed to the Women's Educational Equity Act, passed in 1974 prevent gender discrimination in schools. The IWF's website is also full of articles critical of public schools and in favor of private and charter schools. It isn't clear what Carter stands for in particular, and what she thinks about supporting public schools versus school choice or charter schools. I reached out to Carter asking for more info on these and other issues and she didn't respond. But to her credit, she campaigned hard. She had a slick website and a number of my friends voted for her because she was out talking to people, something her opponent Mary Lord did not do. After they found out what she stood for, they were not happy. Carter also had a big budget, with the majority of her donors coming from outside DC, according to the city's campaign finance site -- a little fishy, if you ask me. In the City Paper article, Carter says she ran as a non-partisan candidate and won because she appealed to people who are disenfranchised and didn't like the current system. So we'll see what Carter will do now. If you have kids or care about DC schools, contact her and tell her what you want to see. If you don't support the IWF's policies, tell her that. Her email is ashley.carter@dc.gov and the Board of Education's phone number is (202) 741-0888 if you'd like to talk to her. Here's the board's website. There are a lot of Jan. 21 post-Women's March activities in our area, like the fundraiser at Midlands, a comedy show fundraiser for the ACLU at Wonderland and other happy hours at local spots like the Red Derby and others, and many local businesses are donating proceeds from the weekend to nonprofits. But there's also opportunities to help directly with the march. Organizers are expecting hundreds of thousands of people to attend, many from outside the city, so they can use the help. And, if you'd like to volunteer there are two options right now to support the march directly. You could be a local ambassador or a marshall. Ambos are placed in key locations to direct crowd to/from the march. Marshalls are along the march route. 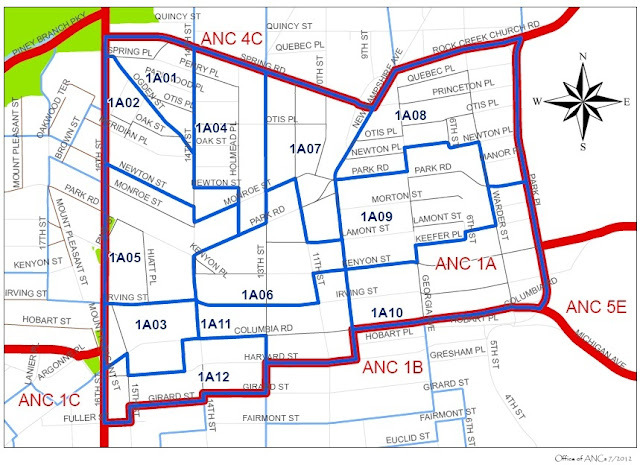 If you're interested to take a local ambo shift, email wmwlocalambassadors(at)gmail[dot]com. They'll send you the link to select a shift. There's also a training you can take, but it's offered online and isn't required. If you're interested in seeing how else you can help, there's a form here to get signed up. New York magazine has a great guide for preparing for the march too if you're an attendee. They also have a guide for where to go to the bathroom -- not always the easiest at a big event. This is good news! 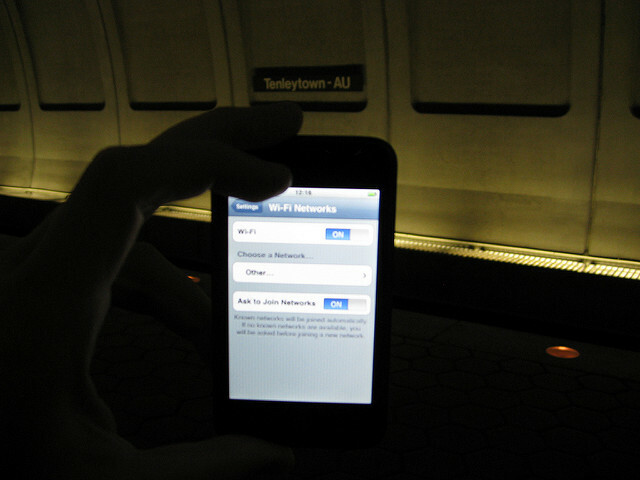 DCist reports that WMATA is adding wifi to all underground Metro stations starting in summer 2017 and finishing in 2018. So far 6 stations already have it: Metro Center, Gallery Place, Judiciary Square, Union Station, Archives and L’Enfant Plaza. Pretty good news, especially as waits will get longer as the Green line portion of SafeTrack begins in April. That part of the work will result in single-tracking between College Park and Greenbelt, and probably longer waits for the rest of us. Work on the far southern portion of the Yellow line begins in March, so that might have some effects for us too. Thankfully though, the Green and Yellow lines have a lot less work scheduled than the other lines, I assume because the Green line is newer. Anybody know any good phone games to play while waiting for the train? There's a lot going on this weekend at the Midlands, the newish beer garden at 3333 Georgia Avenue. They're having a farewell party for the Obamas and Joe Biden on the 20th, plus a post-Women's March fundraiser for the House of Ruth, which helps women and families leave domestic violence situations. Here are the details for both. The Obama-Biden goodbye is a ticketed event with open bar, food, a raffle and more (tickets are $44, naturally, for Obama) plus live band performances and more. 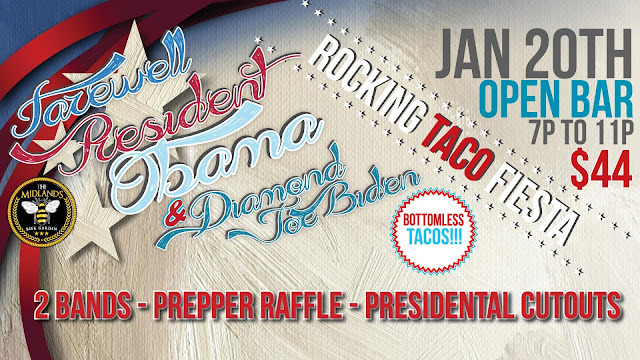 We’ll be honoring our 44th president with 2 bands, prepper raffle (prizes include Dart Board, Propane Pizza Oven, Freeze Dried Food, etc) and cardboard cutouts of Obama & Biden, never-ending tacos and OPEN BAR from 7-11pm. The Midlands would like to invite everyone to join us after the Women’s March to cover our windows & walls with your posters. We also need your help to support the House of Ruth a local charity that helps women, children and families in greatest need and with very limited resources build safe, stable lives escaping domestic abuse and achieve safe housing, trauma recovery, mental health programs, addiction recovery, employment and abuse-free relationships. 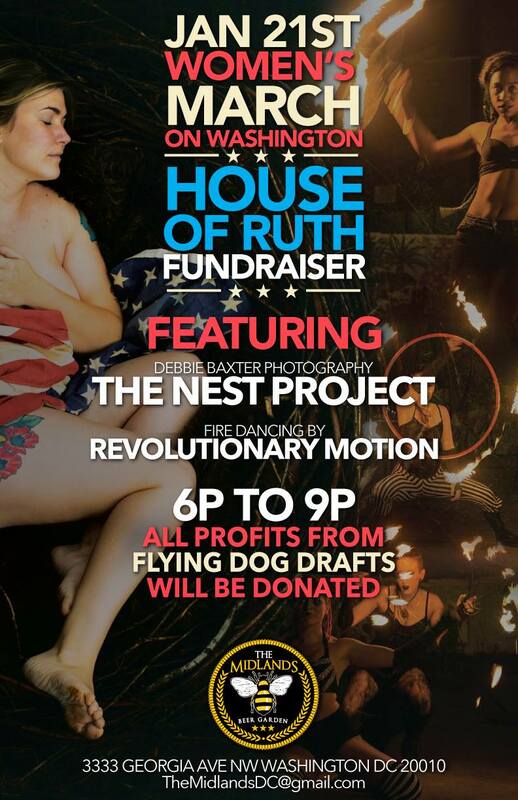 All profits from Flying Dog Brewery drafts from 6P to 9P will be donated. The Midlands will also be hosting Photographer Debbie Baxter who is bringing her Nest Project to our space. The Nest is a project that stems from the notion that as a human race, the universal Feminine and Mother have been wounded for a very long time. And, it shows up in all kinds of ways, in both genders, through various forms of abuse, self loathing, body hating, and extreme amounts of violence and hate crimes. The mission is to get as many people as she can to allow a part of themselves to be held in The Nest reconnecting to The Mother and to The Mother Earth. And, to honor and awaken the inner Feminine and inner Mother within us all. Portraits on this night will be on first come first serve basis. The following day, Jan 22nd portraits will be available via an online sign up sheet. There's other ways to help out too: a lot of local bars and restaurants are donating their profits to nonprofits over the inauguration weekend as part of All in Service DC. There are dozens of spots in the area that are participating -- the list is growing every day! A while ago I wrote about how our neighborhood is the taco-est in the city, and now it's getting even more: the Washingtonian reports that Mezcalero Cocina Mexicano has just opened at 3714 14th Street NW, near the Red Derby and next to Taqueria Habanero. The spot was opened by Alfredo Solis, who runs El Sol in Logan Circle, a mostly take-out spot. 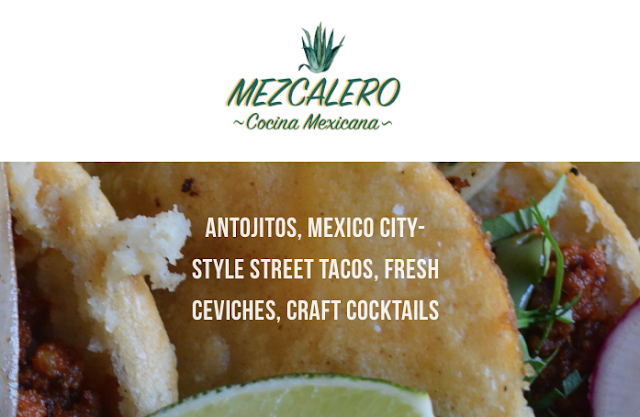 He is from Mexico City and was also the executive chef at Fuego, according to their article. 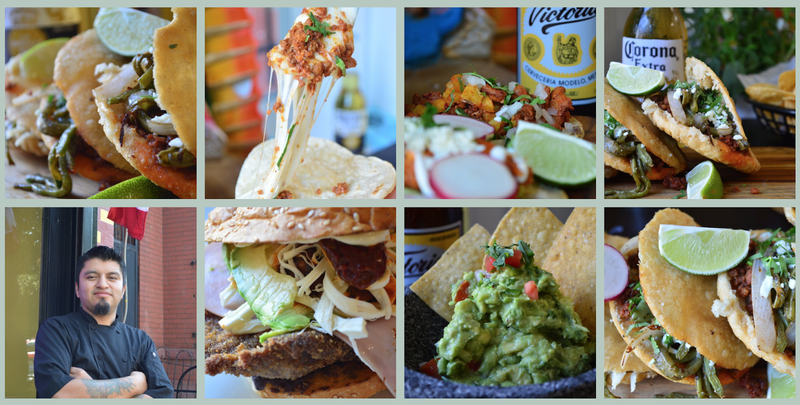 The spot will have a lot of Mexican style street good, 17 types of tacos, tortas, enchiladas, fajitas and other traditional Mexican dishes, plus different types of ceviche, oysters, mole, stew and more. They'll have a three course prix-fixe brunch too for $18. The full menu, which is quite large, is here. There will also be cocktails ranging from $8 to $12 with things like prickly pear and tamarind margaritas, with the drinks from Arturo Zaloga who formerly worked at Marvin. As for competing with the popular neighboring Taqueria Habanero, Solis tells DCist that he thinks there's enough business for both places. I hope he's right! 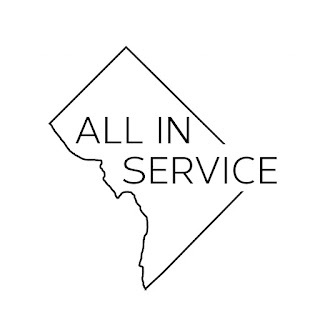 Last week we first heard about All in Service DC, the project where local bars and restaurants donate part of their proceeds over Inauguration Weekend to local charities and nonprofits. A few local places were participating: Room 11, the Coupe, Thip Khao and Maple. And now more spots in our area have signed up: Petworth Citizen, Slim's Diner, Wonderland and Sun's Cinema, and I hear others are interested too. Sun's is supporting Ayuda, Slim's We Are Family DC, Petworth Citizen 826DC, and Wonderland Community Of Hope. There's a bunch of other places participating too around U Street, Adams Morgan and elsewhere. It's a great way to help out nonprofits doing good work. 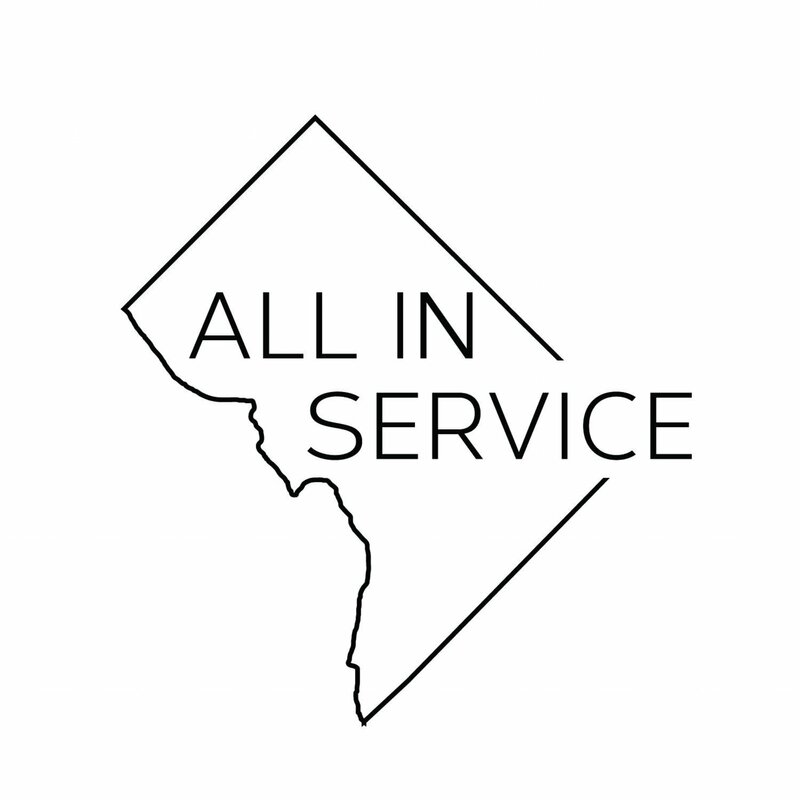 ALL IN SERVICE DC celebrates DC’s diversity by giving back to local organizations that keep our community thriving. This inauguration weekend, eat and drink in DC for good. The events of the inauguration present a vital opportunity to serve our nation’s capital by creating inclusive spaces, in service not only to our guests, but also to our community. These are the fundamentals of hospitality, and it is in this spirit that we invite you to join us. Pretty cool effort. And if you know folks who work at other local bars or restaurants, encourage them to get involved! The other day I finally checked out Letena, the new Ethiopian restaurant on Park Road between 14th and 15th -- and it was good. I originally thought it was a fast casual-type place, similar to Chipotle or &pizza where you go to a counter and pick options, but it's really just a quicker regular sit-down restaurant. I got a meat platter with a buddy, plus Ethiopian coffee and extra injera, and it was a good amount of food for a good price: about $30 with tax and tip for the two of us. A bit more than a fast food place, to be sure, but $15 for a big, tasty Ethiopian lunch isn't too bad. The items were really good too, well-seasoned, a bit spicy and very fresh tasting. I'll definitely go back, and they currently have a 5-star rating on Yelp from 41 reviews -- pretty impressive! Currently they serve lunch and dinner with the same menu for both, but will soon be expanding to coffee, pastries and breakfast with coffee starting at 7am and breakfast from 8:30-11:30am. They're open from 11 am to 9 pm. Coffee comes from Counter Culture, a local roaster. A few weeks ago, we heard that the city is launching their latest Main Street organization to cover Columbia Heights and Mt. Pleasant, through the Columbia Heights Initiative -- the same folks who put on Columbia Heights Day and a do a lot of other local projects. WASHINGTON – District officials and community leaders will officially launch the District’s newest Main Street organization which will cover Columbia Heights and Mount Pleasant at a ceremony Wednesday, January 11 at 10 a.m. on the Columbia Heights Civic Plaza. The official designation ceremony will be held by Councilmember Nadeau, Department of Small and Local Business Development Director Ana Harvey, Columbia Heights Initiative Executive Director Brianne Dornbush, and community leaders. After Ward 1 Councilmember Brianne Nadeau worked to secure funding, late last year the District’s Department of Small and Local Business Development awarded the Columbia Heights Initiative a $200,000 grant to establish the Columbia Heights/Mount Pleasant Main Street. The grant will be matched by private funds. Main Street organizations help major neighborhood corridors thrive by supporting capacity building, business retention, program design and implementation, and commercial-revitalization planning to maintain the traditional and unique character of the distinct neighborhoods. In addition, Councilmember Nadeau recently secured funding for and supported the expansion of the Ward 1 Clean Team, which will now bring additional resources to keep Columbia Heights and Mount Pleasant cleaner as the neighborhoods continue to grow. WHEN: Wednesday, January 11, 2017, 10 a.m. – 10:30 a.m. In her many years of service to the community, Councilmember Brianne K. Nadeau (D-Ward 1) has brought perspectives from a career that spans the non-profit, public and private sectors. She is committed to strengthening our schools, increasing affordable housing and promoting government transparency and the highest ethical standards. She serves as the Chair of the Council’s Human Services Committee. Prior to joining the Council, she was a strategic advisor to faith-based, Democratic and environmental non-profits, and is a former ANC. Follow her on Twitter @brianneknadeau or at Facebook.com/brianneknadeau. 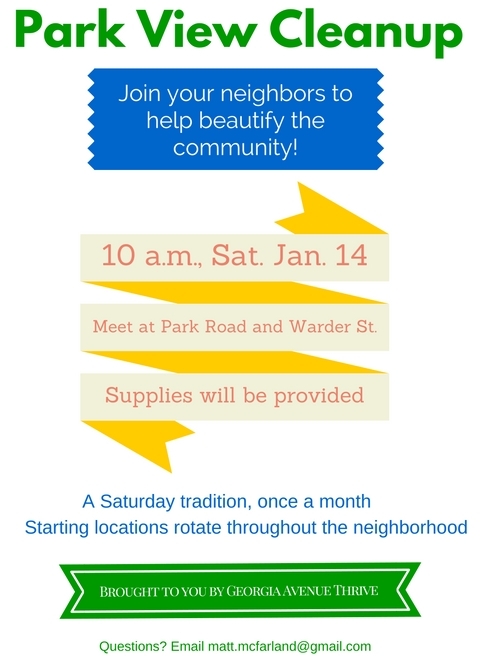 Here's another opportunity to meet your neighbors and clean up our area -- Georgia Avenue Thrive has organized their latest cleanup for this Saturday. The weather should be nice. Georgia Avenue Thrive meeting this Monday at Small Fry: beautification, public safety, come suggest your ideas! Georgia Avenue Thrive, the active nonproft in our area, has their next meeting this Monday (today) from 7-8:30 pm at Small Fry -- now with Sundevich sandwiches! Hope everyone had great end of 2016 and are up for making 2017 as good as we can in the Georgia Ave neighborhood! 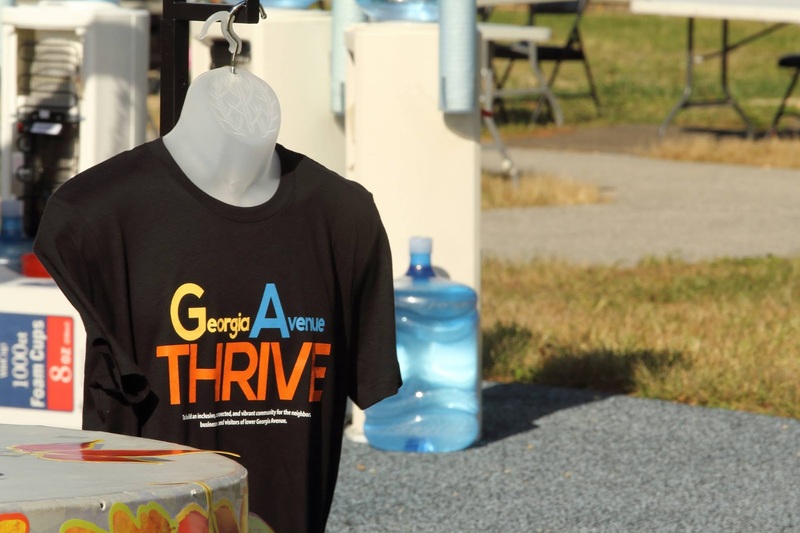 Please join us for Georgia Ave Thrive's monthly meeting THIS MONDAY, JAN. 9, 2017, 7-8:30PM, at SMALL FRY (3212 Georgia Ave NW, beside the awesome District Dogs). Come early for dinner or plan to chew and chat during our meeting from Small Fry's delicious new menu (lots of salad and sandwich options from the tried and true SUNdeVich favorites). Or hang out for a post-meeting debrief at their sister neighborhood bar Union Drinkery next door! These meetings are a great way to learn how to be a part of upcoming neighborhood activities. We are just figuring out 2017 priorities so great opportunity to come pitch your own ideas for local community building with your neighbors! * How can monthly street clean-ups strengthen volunteer outreach? * Georgia Ave Thrive 501(c)(3) status? We will also need a volunteer to facilitate next meeting in February! Union Drinkery and Small Fry on Georgia now serving full Sundevich menu! Oh man, this is awesome. Union Drinkery, the relaxed neighborhood bar at 3216 Georgia, and Small Fry, the BBQ spot next door, will now be serving the full menu from beloved sandwich spot Sundevich. The same folks own them all, so it makes sense. 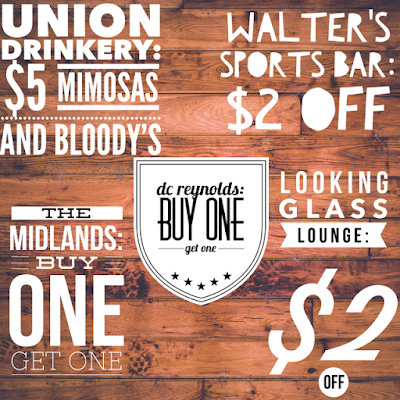 I know a lot of folks are big fans of Sundevich, and I'm also a big fan of Union Drinkery -- it's a cozy, cool spot with reasonably priced drinks, a lot like A&D, their other bar in the Mt. Vernon Square area. They recently posted about it on Twitter. Good news! 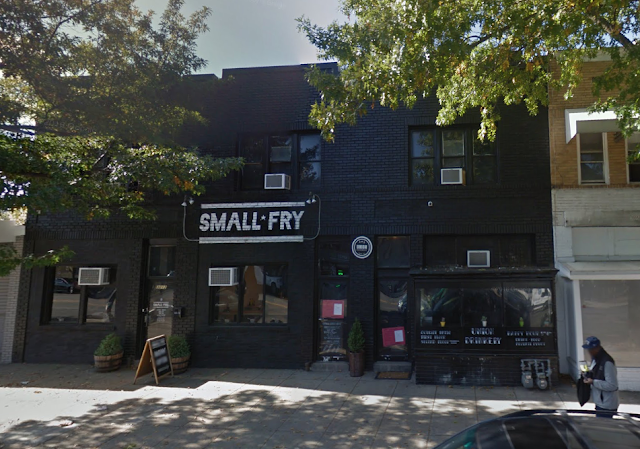 I believe they'll also still offer the Small Fry menu, which includes BBQ, scotch eggs, poutine, veggies and more. Photo from Google Street View. That's Union Drinkery on the right. This is pretty awesome: a group of DC bars and restaurants have joined to create All in Service DC, where they'll donate a portion of the proceeds over Inauguration Weekend to local nonprofits and charities: Mary's Center, Ayuda, Martha's Table, ThriveDC, Planned Parenthood, and others. Different places will donate to different groups: in our area, the Coupe will be donating to Mary's Center, Room 11 to Martha's Table, and Maple to ThriveDC. Thip Khao's recipient isn't listed. There are 18 total bars and restaurants participating right now donating to a number of groups outside of those listed above, too -- some nearby in Mt. Pleasant, Adams Morgan and U Street. And they're asking other local establishments to join too. The Washingtonian notes it's mainly apolitical but that some groups are giving to groups like Planned Parenthood and Human Rights Campaign too. Sounds like a great opportunity to patronize local establishments while helping local groups. A bit ago we learned that Tchoup's Market at 3310 Georgia was closing and that the space will host pop-ups and special events. 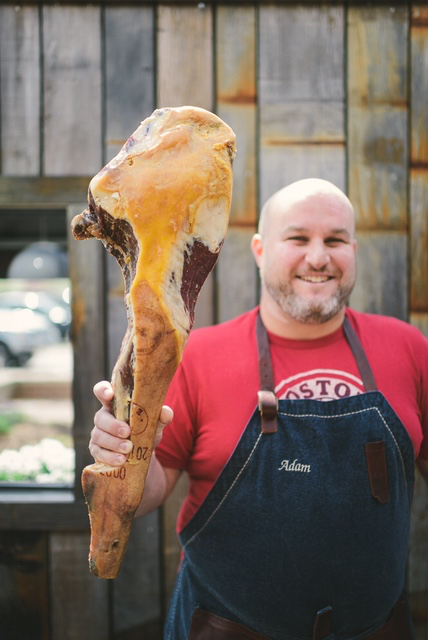 Chef Alex McCoy recently sent me details of what's coming next: a collaboration between McCoy, Food Network Chopped Champions winner Adam Greenberg, and Acme Pies, plus a number of special events. The pop-up will be Saturdays and Sundays from 11am-4pm with Hawaiian-style poke bowls from Greenberg (pictured above), coffee and cocktails from Fabian Malone and the Alfie's staff and pies by Sol Schott of Acme Pies. McCoy said "Think of it like a co-op. A bunch of chefs collaborating in the space." Greenberg was also the head chef at Barcelona on 14th Street. Here's more on the menu: the first one features a tuna poke bowl, jerk chicken and a Hawaiian burger. 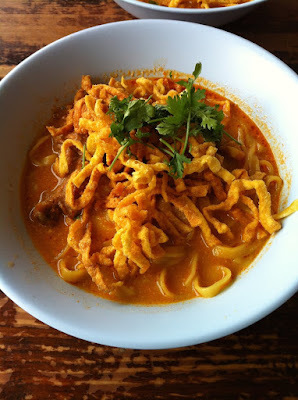 The evenings on Friday and Saturday night will continue to be Nok Noi, their Thai street noodle popup, open 5-11pm. There are also special events coming up, some ticketed and some not. On January 26th they'll be hosting "Isaan Supperclub dinner" with 6 courses of dishes from the eastern Thai region for $45 per person. A lot of the Alfie's food is based on Isaan cuisine. On February 2nd, they'll host a Khao Gheng (curry and rice) dinner with four different Khao Gaeng-style curries, rice and kanom bean noodles for $35 per person. Also in the works is a collaboration with Wild Turkey bourbon for Nashville hot chicken. Details for the three special events are on their site too. Whoa! Comedian and actor Patton Oswalt made a surprise appearance at Sunday's Underground Comedy event at Wonderland. The stand-up comic, who was also in Ratatouille, 21 Jump Street and other films, did a set and also tipped the bartender $10 for a soda water. Wonderland called him "a real mensch!" This isn't the first time Wonderland has hosted surprise sets from famous comics -- Hannibal Burress appeared last year, for example. I wonder if either met up with Drake at Z-Burger later on? 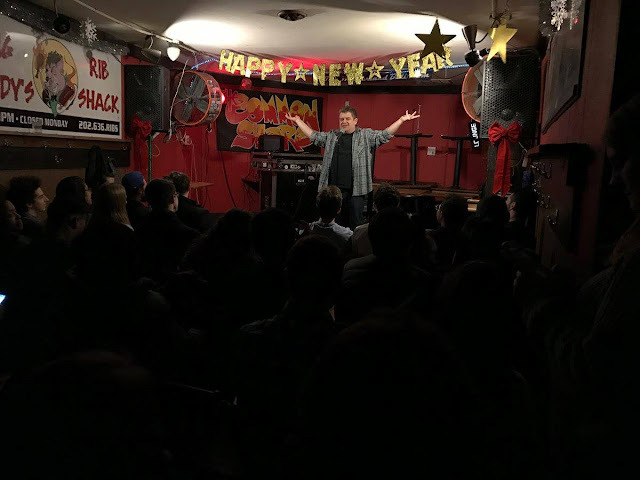 Underground Comedy does shows at Wonderland and other venues around town and they sometimes feature famous comics -- Burress was recently at the Big Hunt, for example.